HEC has received offer of Scholarships, from Islamic Development Bank (IDB), for PhD and Post Doctoral Program, offered in the world renowned universities, for the session 2012-2013. Application are invited from all bright Pakistani / AJK nationals, possessing very good standing/grades, as required by the IDB, belonging to the Public, Private Universities and R&D bodies, who would like to pursue their career in Science and Technology, in their home country. To strengthen the scientific, technological and research capability of institutions in member countries. The IDB Merit Scholarship Programme is only for scholars from member countries who are (still) attached to their educational, scientific and technological institutions and research centers in their countries and are actively working in the scientific and technological development of their countries. The IDB Merit Scholarship Programme does not award scholarships to individuals but to promising and/or renowned scholars as sponsored by their institutions and nominated by authorized agency of their country (HEC, in case of Pakistan), as seen suitable and appropriate by the Offices of the IDB Governors of their countries in terms of the developmental and scientific needs of their countries. Completely fill HEC application form with the help of computer, don’t attach both HEC and IDB forms. Attach all the documents with IDB Application Form as mentioned in the Eligibility Criteria section of each program (above) as well as in the How to Apply section of IDB Application form. Do not attach HEC application form with IDB Application form. 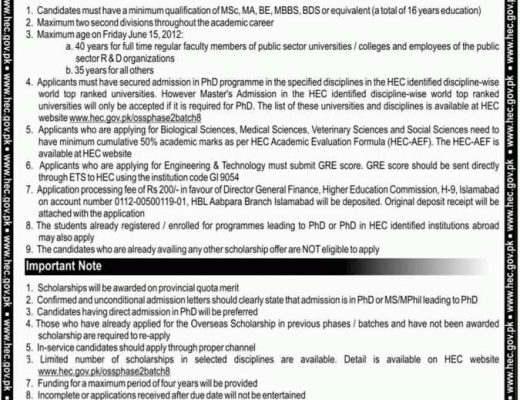 HEC application form must be sent separately. Also, attach the print of THES list highlighting the Host University ranking number, with HEC application form only. Completely pin up / staple each application form, loose applications will not be entertained. Note: HEC is only facilitating in the processing of the said scholarship and has no financial liability in this regard. Initially the applications are screened by the offices of IDB Governors or other IDB appointed Focal Points. The application are then processed at the IDB to ascertain the completeness of application documents and the eligibility in terms of the criteria of the Programme (i.e., age, degree, grades, experience, publication and field of study) and other relevant conditions of the Programme (i.e., command of the language of study, pre-admission, institutional attachment and nomination and the IDB Governor’s endorsement). For Muslim Communities in non-Member Countries, applications are to be submitted through designated IDB CPOs and Muslim Organizations. Applications are reviewed in detail by a panel of eminent scientists to ascertain the scientific and development relevance of the field of study proposed by the applicants and to assess the overall qualifications of the applicants. Recommendation for final selection is made by the Executive Committee for the IDB Merit Scholarship Programme to the President, IDB. Once the announcement of selected candidates is made, successful candidates must utilize the scholarship within a period of one year. If by that time, the awardees have not been able to secure admission from Universities/institutions of study under the Programme, the offer will lapse. Placement begins with the Fall session (September) or the Winter session (January), for those who will pursue three-year Ph.D study. For Post-Doctoral research, placement may begin at any time as long as all the requirements for departure are met, i.e., secured admission, receipt of signed and completed Surety Bonds at the IDB, and medical and insurance clearance. Medical coverage is issued by an international insurance company contracted by the IDB for the purpose. To assist admission and placement, all selected candidates are supplied with a Handbook for Scholars which contains instructions on how to prepare for their departures, and on how to conduct themselves during the entire period of their studies and afterwards. The scholarship covers all academic, institutional and living expenses including medical coverage and return air tickets. The Ph.D Scholars are additionally paid family allowances for spouse and up to 2 children.